Rare ‘Big Band’ show in Oregon! 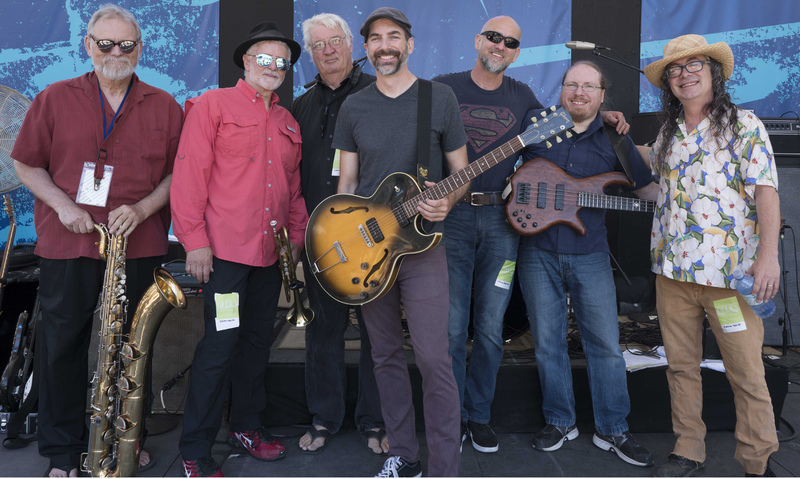 Coming up on Monday, April 1 our ‘Big Band’ otherwise known as Kevin Selfe and The Portland Blues All Stars will be performing at the Lake Theater & Cafe in Lake Owsego, OR for Music Mondays. It’s a rare opportunity to see us locally as we haven’t played a club show in Oregon in over a year. Winners of two prestigious Muddy Awards for Performance of the Year, the band consists of some of greatest talent in the area and beyond. 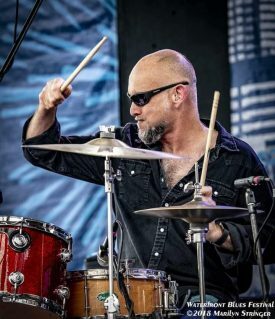 The show will feature 2015 Blues Music Award Winning drummer Jimi Bott (Fabulous Thunderbirds, Mannish Boys, Rod Piazza), Chris Mercer – tenor sax (John Mayall, Freddie King, The Pretenders), Jonathan Chase – bass (Kevin Selfe, Rose City Kings), Joe McCarthy – trumpet (DK Stewart, Duffy Bishop), Brad Ulrich – baritone sax (Duffy Bishop), Steve Kerin – keys (Rose City Kings, Too Loose Cajun Band, Atomic Gumbo), and me on guitar and vocals. Make sure to get tickets soon as this show sold out last time! Final show at Highway 99 Blues Club in Seattle! Hi everybody! As many of you have heard, our beloved Highway 99 Blues Club will be closing it’s doors on December 31. This will be the last time we have the opportunity to perform there. We have had so many memorable evenings at the club, from CD release parties to NYE shows, to epic nights with the “Big Band”. Please be sure to make plans to attend this special show on Saturday, December 22. The band will feature 2015 Blues Music Award Winning drummer Jimi Bott (Fabulous Thunderbirds, Mannish Boys, Rod Piazza), Chris Mercer – tenor sax (John Mayall, Freddie King, The Pretenders), Jonathan Chase – bass (Kevin Selfe), Joe McCarthy – trumpet (DK Stewart, Duffy Bishop), Brad Ulrich – baritone sax (Duffy Bishop), Steve Kerin – keys (Too Loose Cajun Band, Atomic Gumbo), and Kevin Selfe – guitar and vocals. Returning to Oregon in November! Hi everybody! I am writing to you from the Appalachian Trail to let you know that I will be back in Oregon in the beginning of November. I have lots of exciting shows planned already and am so looking forward to playing for you all again. Hiking the trail has been an amazing experience and at this moment I have hiked 1765 miles. Only 425 left to go on my “Long Walk Home”! Thanks everyone for all your support and looking forward to seeing you soon! So my friends, I have some news to share with you. I will be leaving Oregon in February and heading back to Virginia. I will be spending some time with my mom and my family and try and help with some things around the house that need attention in the years since my dad passed away. After that, and depending on the timing, I am hoping to thru-hike the Appalachian Trail. The past 10 years in Portland have been some of the greatest of my life. All the people I have meet and become friends with, all the shows I’ve played, all the things I’ve experienced…it has been nothing short of an amazing miracle and I am so grateful. I do hope and plan to come back to Oregon at some point. I will be playing all the shows that I have booked on my calendar through the end of February. Please come out and say hi as I’d love to see you all before I leave. After that my band will continue to host the jam at the Blue Diamond until I come back and will have a special guest each week. Please support them and help keep the jam the special gathering of friends and musicians it has become. Thank you all so much for the love and support you have shown me over the years. I am truly a blessed man. Kevin Selfe receives 2016 Muddy Award! 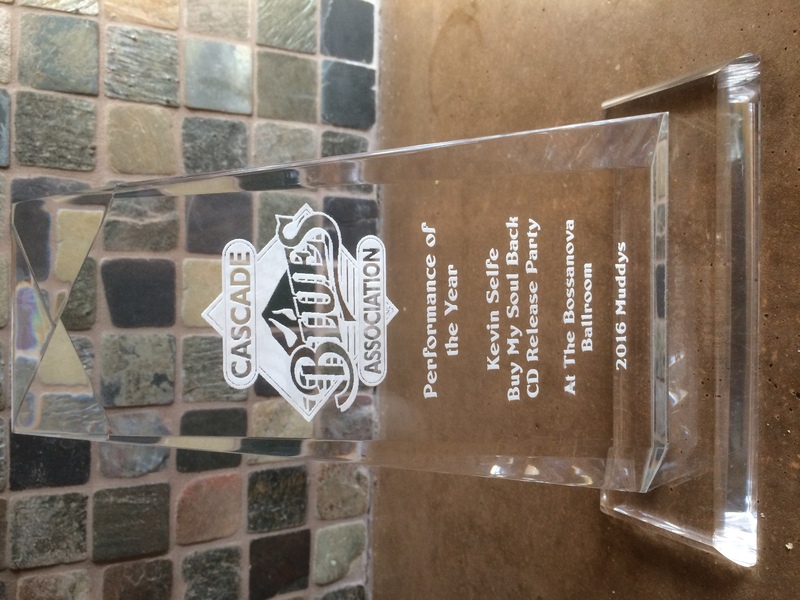 On November 2, the Cascade Blues Association in Portland, OR held their annual Muddy Award ceremony. 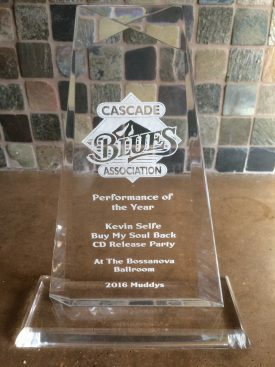 We are honored to announce that we received the 2016 Muddy Award for Performance of the Year for our “Buy My Soul Back” CD Release Party at the Bossanova Ballrom. Thank you to the CBA, and the members for recognizing and supporting us, and thanks to all who helped make that night such a memorable experience!